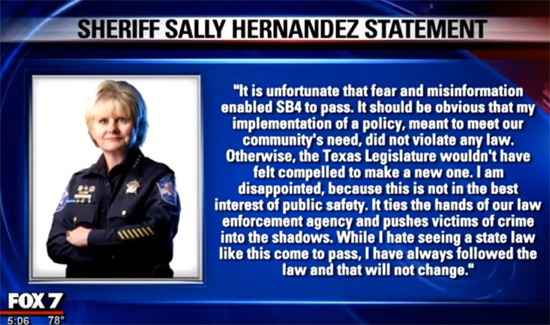 The State of Texas can now imprison law enforcement officials that won’t do the federal government’s job for them vis-a-vis immigration enforcement. In the State of New York, it’s basically the opposite. Governor Andrew Cuomo recently told law enforcement officials that they may not ask about people’s immigration status during contacts. At least one sheriff has told his deputies to ignore the governor’s executive order. “Our officers have sworn a solemn oath to uphold the law,” Erie County Sheriff Timothy Howard said in the statement. “As sheriff, part of my job is enforcing our constitution and the law, regardless of what cheap political points Albany politicians are looking to score.” It’s unclear if local law enforcement leaders in Texas will also be ignoring state officials looking to score said political points. A federal appeals court has allowed some aspects of Texas’s anti-Sanctuary City bill–SB4–to go forward. Art. 2.251. DUTIES RELATED TO IMMIGRATION DETAINER REQUESTS. (a) A law enforcement agency that has custody of a person subject to an immigration detainer request issued by United States Immigration and Customs Enforcement shall: (1) comply with, honor, and fulfill any request made in the detainer request provided by the federal government; and (2) inform the person that the person is being held pursuant to an immigration detainer request issued by United States Immigration and Customs Enforcement. The above-quoted provision is now being allowed to take effect pending further litigation. Thus, any police officers, chiefs or sheriffs who violate that provision–and refuse ICE detainer requests–will now be subject to criminal penalties. The only caveat is that officers who are aware of a person’s lawful status in the country–via official documentation–can then deny a wrongfully-issued ICE request. Sec. 39.07. FAILURE TO COMPLY WITH IMMIGRATION DETAINER REQUEST. (a) A person who is a sheriff, chief of police, or constable or a person who otherwise has primary authority for administering a jail commits an offense if the person: (1) has custody of a person subject to an immigration detainer request issued by United States Immigration and Customs Enforcement; and (2) knowingly fails to comply with the detainer request. (b) An offense under this section is a Class A misdemeanor. In the State of Texas, Class A misdemeanors are the most serious criminal offense shy of a felony. Punishments include a fine of up to $4,000, up to one year in prison, or both the fine and prison sentence. The prospect of local police being arrested is a bit unusual and, as of now, it is unclear who would be arresting local law enforcement under the provisions recently allowed by the court’s order staying most of the injunctions issued against SB4. LawNewz reached out to Texas Attorney General Ken Paxton for clarification on this issues, but a reply was not forthcoming at the time of publication. This post will be updated if and when such a response is received. Texas’s anti-Sanctuary City bill was passed on a party-line vote by GOP members of the Texas legislature on May 5, 2017. A lawsuit was immediately filed against the State of Texas by Raul Reyes, the mayor of El Cenizo, a town on the Texas-Mexico border. That lawsuit was later joined by the Cities of Austin, Dallas, Houston and El Paso, amongst other plaintiffs. On the strength of that lawsuit, most of SB4 was blocked from going into effect by U.S. District Judge Orlando Garcia on Aug. 31, a day before it was scheduled to go into effect.